The falling cost combined with the performance of LED light bulbs has transformed the way we light our homes and businesses. But, it has also generated a lot of confusion that was not there before. 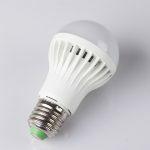 Now, instead of looking just at the watts, there are many different characteristics of an LED light bulb that must be taken into consideration. This resource will help you work through the new questions you should be asking. Also, download our lighting calculator to see how much money you can save by switching to LEDs. Many of you have probably seen a label like these when shopping for lighting. It is important to look at the lighting facts label when buying bulbs just like you look at the nutrition facts when buying food. Instead of focusing on the wattage when buying light bulbs, there are many different categories that affect the performance of the bulb you are buying. The question is what do all the different categories mean? Instead of looking for the wattage to determine how bright the bulb is, look for the lumens. Wattage is a measure of the energy used by a bulb. The higher the wattage, the more energy a bulb uses. With incandescent bulbs, wattage was a good measure of brightness. Now, because LEDs and use significantly less energy, wattage does not accurately portray the level of brightness. 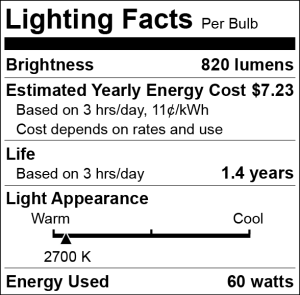 Lumens is the actual measurement of visible light. The table below shows a handy comparison between lumens and the wattage of the different bulbs. This tells you roughly how much money you will spend per year given a bulb that is used three hours a day with an electric rate at $0.11. This is a great tool to compare the different types of bulbs and compare different LEDs with each other as well. By comparing the two Lighting Facts labels, you will see that the cost of LEDs are significantly lower than the cost of incandescent bulbs on a yearly basis. So, even though the upfront costs are higher, you will save money in the long run. Consider the purchase of LEDs an investment that will pay off in the long run in money and energy savings. Download CUB’s lighting calculator to see how much money you will save over time by switching to LEDs. This is an important measure to consider when purchasing light bulbs. You will see that LEDs last significantly longer than incandescent and CFL bulbs. This is really helpful when comparing different LEDs. While the price of LEDs has been dropping significantly as technology has gotten better, there are still LEDs out there that are not the highest of quality. Check the estimated life to find those that will last long enough to see money savings. The quality LEDs will still run at a higher price, but the cost is well worth it to save a significant amount of money on your electric bill. This may be the most unfamiliar feature listed on the lighting facts. In comparison to incandescent and CFL light bulbs, LEDs have a large range of color options. This has led to the need to measure the different colors of LEDs so consumers know what they are buying. Color is measured by a unit called Kelvins (K). If you are looking for something similar to the color appearance of incandescent bulbs, 2700K would be a good place to start. As you get higher on the Kelvin scale, the light becomes cooler and whiter. Office buildings and retail stores typically use a whiter light. If this is the color you would like in your home, look for a bulb around 4000K. Anything above 4500K will give off a blue-white light that is similar to daylight. In comparison, the lower you get, the closer you get to a warmer looking color like that of candlelight. Many LEDs are not compatible with dimmer switches. It is important to check to make sure the ones you are purchasing are dimmable, and expect to pay more for that feature. While LEDs give off much less heat than incandescent bulbs, they still give off heat. Most LEDs include a heat sink to dissipate the heat it generates. However, in an enclosed area there is nowhere for that heat to go. LEDs are much more sensitive to heat so this will greatly shorten the lives of your bulbs. Look for information on the lightbulb packaging to make sure your bulbs are safe to use in enclosed spaces. If using CFLs to light your space, try to use them in areas where you are not constantly cycling the lights on and off. Because CFLs take longer to reach its full light when turned on, frequent cycling reduces the life of the light bulb.